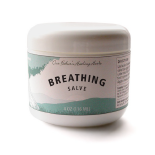 Description: This deep penetrating formula is wonderful for opening the breathing passages. It also helps with sinus congestion, colds, asthma and bronchitis. Ingredients: Fenugreek Seed, Comfrey Root, Mullein, Lobelia, Olive Oil, Beeswax, Menthol Crystals, Eucalyptus Oil, Wintergreen Oil, Vitamin E Oil, Pine Oil,Peppermint Oil, Camphor Oil and Thyme Oil. Description: Itchy skin, candida yeast infection, shingles (herpes zoster) insect bites, genital herpes, diabetic ulcers, skin wounds and infections and general body pain. Ingredients: Whit Willow Bark, Shavegrass, Ginger Root, Licorice Root, Tumeric Root, Cranesbill Root, Aloe Vera, Yellow Dock Root, Tumeric, Arnica Flowers, Cayenne, Olive Oil, Beeswax, Calcium, Wintergreen Oil and Vitamin E Oil. 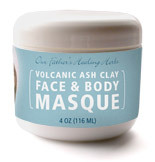 Description: 100% natural volcanic ash clay with land and sea minerals (including magnesium sulfate and magnesium chloride) This blend of mineral-rich volcanic ash clay naturally helps tighten the upper skin layers, re-hydrates dry cells, draws out toxins, and will leave your skin feeling soft and cleansed. Description: dry, chapped lips, skin blemishes, scrapes and cuts and diaper rash. Ingredients: Olive Oil Shea Butter (African bean) Jojoba Oil, Castor Oil, Vitamin E Oil, Comfery Root, Marshmallow Root, Turmeric Root, White Oak Bark, Beeswax, Eucalyptus, Tea Tree, Lavender Oil and Spearmint Oil. Description: Insect bites, ringworm, scabies, animal wounds, infectious wounds, any type of skin infection: bacterial, viral or fungal. Ingredients: Pine Pitch, Olive Oil and Beeswax.